This pulpit, carved for the main church at La Santísima Trinidad, was originally installed in the early 18th century. 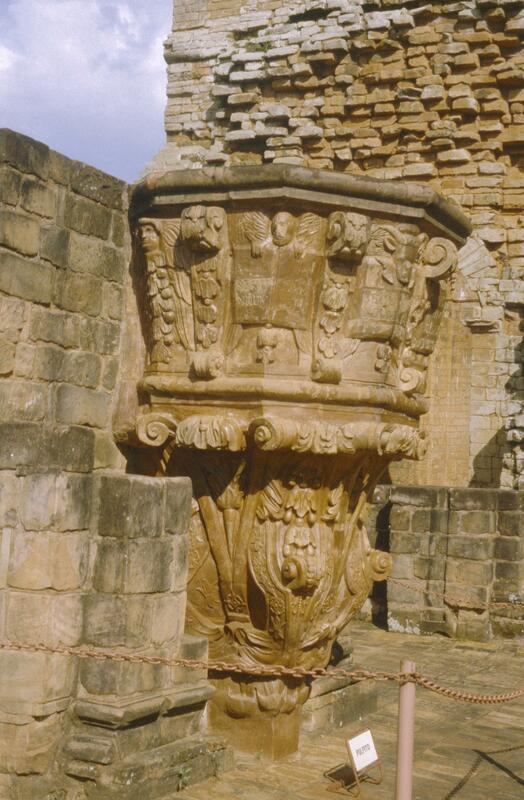 One of the many carvings created by the Guaraní for the sacred spaces of this Jesuit mission complex, the pulpit displays imagery derived from European engravings and images imported to the missions in Paraguay by Jesuits. In many of the missions, Guaraní apprenticed under Jesuit fathers to learn to paint and carve. 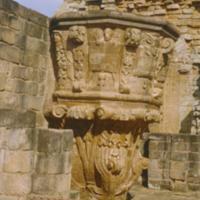 While it is likely that Guaraní carved the original of this pulpit, no indigenous resident of La Santísima Trinidad would have preached from it. It features scrolling forms that were appropriated and reworked by Guaraní carvers from European models. This juxtaposition of carving in high and low relief suggests the work of a skilled hand. Among the “lessons” Jesuits taught the Guaraní at La Santísima Trinidad: how to create works of art for churches. Not only did the Guaraní carve pulpits and wall decorations, they also carved and painted retables (rretablos)—some of which were exported into other areas of South America in the 18th century. UNESCO. 1992. Jesuit Missions of Paraguay. World Heritage Advisory Body Documentation.